Each rubric works in a slightly different way, and each has slightly different uses. A standard rubric can be created using the % icon. This type of rubric will give you the ability to set percentage weightings for each criteria making up the rubric. For instance if you have 4 criteria, you could give each one a 25% weighting. Or as another example you could have a weighting of 20%, 20%, 20%, 40%. Use this rubric when you want to assign weighting to each criteria, which will then be used to automatically calculate a numerical grade for the submission. 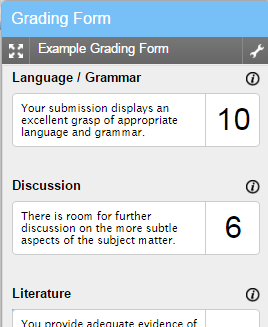 A custom scoring rubric can be created using the pencil and paper icon. This will give you the ability to score each individual cell within the rubric. The maximum score that can be attained using this method is the sum of the highest points available in each of the criteria rows within the rubric. Use this rubric when you wish to specify different points values to each individual cell within the rubric, which will then be used to automatically calculate a numerical grade for the submission. A qualitative rubric can be created using the ‘0’ icon. This allows you to create a qualitative rubric, i.e. one which has no numerical scoring. Instead, the rubric is purely qualitative. Use this rubric when you do not wish to award a specific score, but just wish to provide detailed feedback. Use a grading form when you want a very simple rubric which allows you to set a number of criteria and then provide a comment for each one (and a mark if desired).